A huge voiced dramatic ballad from New York, Standing In The Need Of Love has been unjustly neglected as it is on the flip of a high cost Northern track. But uptown city soul is a style that can get right under your skin as this cut does to me. 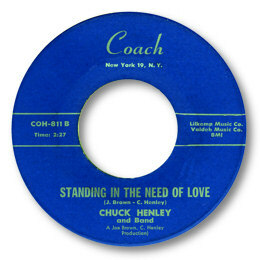 Partly it’s the harsh tone and passion that Chuck brings to his own composition and partly it’s the first class arrangement. Another obscurity that you won’t see for sale very often.